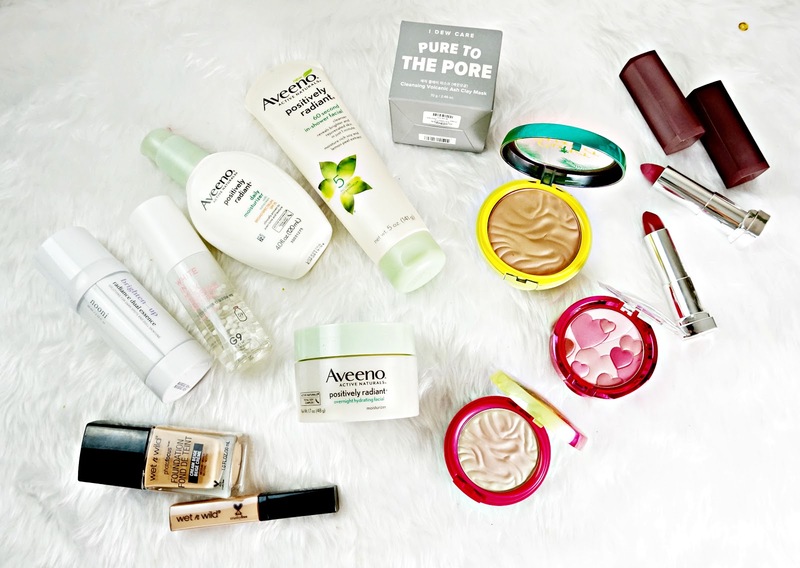 As promised in my New York Sephora Haul (here) I'm back with my drugstore haul. I was a little under whelmed by their drugstores to be honest. They did have a lot in terms of shade range but it wasn't any cheaper than here after you add the tax on, in fact it might have been a little bit more expensive. But anyway I managed to pick some things I've wanted to try for ages. I also brought some stuff in Urban Outfitters. I've not really heard a lot about Aveeno Skincare, but I wasn't instantly drawn to it. I know we can get their body care in the UK but for some reason not the facial skincare line. The first thing I got was this overnight cream. My skin was so dry while I was out there so I wanted something to help so I used this straight away. And WOW! I was instantly impressed by this. It claims to be deeply nourishing to work on dryness, dullness, and texture. Which this really does. My skin felt so smooth in the morning and hydrated. The cream itself isn't heavy or thick, it's actually quite light. I've been using this everyday since buying it! I really hope this comes to the UK soon. I picked this up too because it sounded amazing. It claims to brighten, and deeply cleanse the skin 4x faster than a regular mask. It contains AHAs too. It has a paste like texture with small scrubby particles in it. I do really like this, it does leave my skin smooth and a little brighter. I don't think this works any better or quicker than other masks though. But I'm happy with this and will continue to use it. After seeing such quick, amazing results from the night cream I wanted the day moisturiser too. So I went back and picked this up. It claims to do pretty much the same thing as the night cream but this contains an SPF. The formula is a little lighter. And it does the same thing as the night cream. It instantly makes my skin feel soft and smooth. I'm not really sure what the ingredient in these is that is doing that but I'm so impressed! I really can't recommend this range enough. For those in the UK you can check the range out on Amazon here. Everyone and their nan raves about this the bronzer and most places didn't have it but I managed to find one. It's a matte bronzer that smells of Coconut. The formula is really soft and applies with ease. But unfortunatly the shade isn't right for me. It's far too cool toned, it looks dirty and muddy on me. I'm gutted. I'm going to try it when I'm not tanned though. Alongside the bronzer I picked up this blush in the shade Plum Rose. The annoying thing about US drugstores are you can't test the products but you can take stuff back. Which, with me living in the UK isn't helpful. But anyway in the packet this blush looks like a really nice, natural muted Mauve colour. But to swatch this is actually a lot duskier. It's a really pretty shade. I've not used this on my face yet though because I'm not convinced it will work for me. I'll keep you updated. I remember everybody used to love this on Youtube a few years ago so I thought I'd pick it up. It contains various different shades of Pink, when mixed together this creates a gorgeous Plum colour. It has a satin finish and a kind of healthy sheen to it. It's not glittery or chunky, it just makes the face look really healthy. I know we can get this line in the UK but we don't have many shades. I love the formula of Maybellines Matte line. The lipsticks are really comfortable, easy to apply, pigmented and really long lasting. I picked Two shades. Touch of Spice and Lust for Blush. Touch of Spice is a warm Plum colour but on me this actually looks quite Pink, which I actually really like. Lust for Blush is a Pink shade with Blue undertones. This isn't a shade I'd typically go for but I'm hoping to make it work. Wet n Wild is another brand that we can't get in England, although this is available in Ireland. When I heard Siobhan from Beautylymes talking about this I knew I had to get it. We have a similar taste in foundations. And I love this. It has a really light blend-able consistency that really evens out skin tone and has an almost blurring effect on the skin. Everything looks perfected but not in an unnatural, heavy way. The coverage is medium but customisable, it can be sheered out or built up to full coverage. It doesn't cling to any dry patches or problem areas. This is actually One of my favourite 'drugstore' foundations I've tried in a long time. If you can get your hands on Wet n Wild I really recommend checking this out. I brought the matching concealer to the foundation. But I don't think I love this as much. It does have a really nice creamy, blend-able formula but the coverage is a little to sheer for my liking. It can be built up but I found this creases on me. I'm going to continue testing it and report back. I've never even heard of the brand but this product looked really intriguing. It's a serum with little White balls suspended it in. These White balls break and dispense when the product is pumped out. This claims to be a brightening and hydrating serum. It as a serum like consistency but it melts into a watery one when applied to the face. It is really hydrating and really helps to plump the skin. I'm not too sure about the whole brightening thing but I've not been using it that long. Overall, I really like this. Again this is a brand I've never heard of but the concept of this really intrigued me. It's Two products in one bottle that you use together. One side aims to brighten and fade dark spots. The other side hydrates and soothes the skin. I've not tried this yet but Koreans really know their skincare stuff so I'm excited to test it. Another Korean brand I've never heard comes in the form of this mask. This is aimed at oily, spot prone skin, to deeply clarify pores. I don't have oily skin but I do enjoy a good deep cleanse. This mask uses volcanic extract to unclog pores and leave the skin soft and smooth. I've used this once and it does leave my skin feeling really clean. So that's everything I picked up from the drugstore and Urban Outfitters on my New York trip. Do let me know if you've heard of any of these Korean brands and how you got on with them.